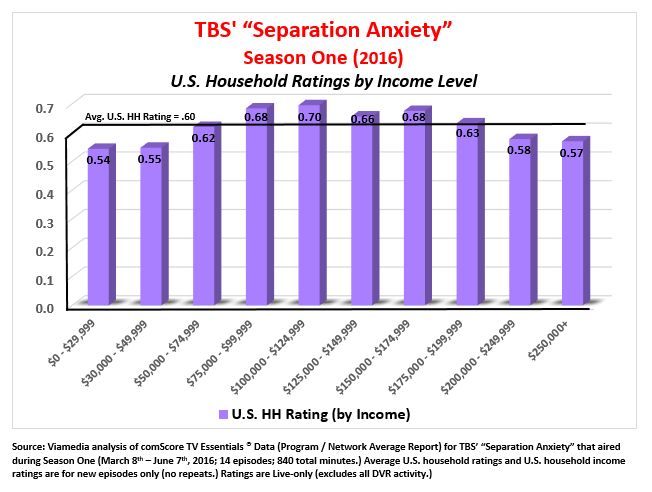 “Separation Anxiety” – and I am not referring to the psychological disorder – is a primetime gameshow from TBS that is a modern update (with a twist) of the 1960s “The Newlywed Game.” The predecessor show was based on the premise that newlyweds may not know one another all that well. The format was fairly straightforward: first, the husbands (with their wives off-stage) were asked a series of questions (some of which were quite provocative) that they answered in the context of how they thought their wives would answer. Then they would bring the wives back on stage to find out their actual answers. The real fun was when their answers diverged from their husbands’, which could lead to anything from dirty stares to outright arguments – encouraged of course, by the game show host. Then it was the wives’ turn to answer for their husbands. It was, all in all, quite humorous and honest, good fun, except perhaps for those couples who ended up getting divorced. Fast forward to TBS’ “Separation Anxiety”, which is hosted by the comedian Iliza Shlesinger. The foundation of the show is based on a hoax played on a couple (not necessarily married) who have signed on for a rather low-budget Internet game show in which they stand to win a prize as high as $2,500. But right before the game gets underway, one of the participants is told that he or she will play in the second round and is led away into -- surprise -- an entirely different (and upgraded) TBS studio setting. Once there, the truth is revealed that this isn’t really a low-budget Internet game, but rather a high stakes game show in which the grand prize is a quarter of a million dollars! I guess that’s when the separation anxiety sets in. You see, the partner in the high tech studio has to stand by and watch the other partner try to answer questions that he or she believes don’t really count for very much ($2,500 max). Moreover, the partner in-the-know must select the category of questions and then stand by while the other partner struggles with them. More anxiety, I suppose. 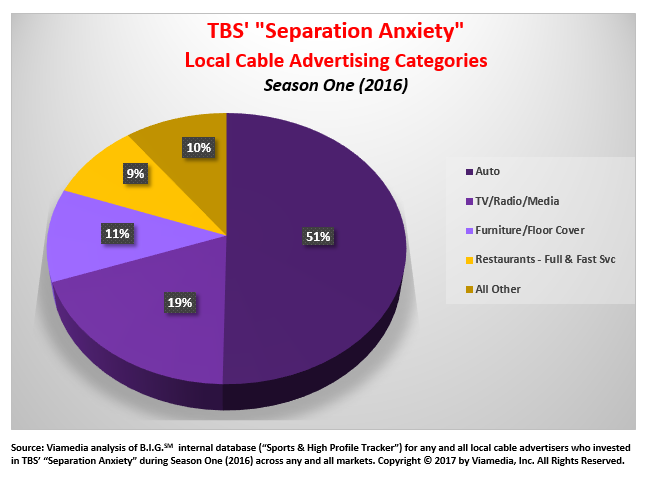 “Separation Anxiety” has been on air for only one season, so we have no baseline comparisons to quantify year-over-year sales metrics. 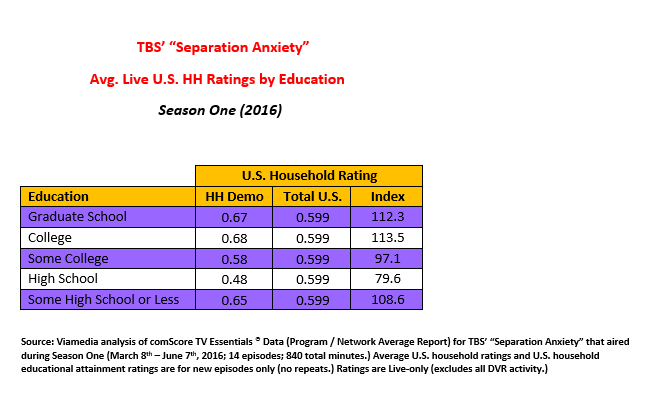 All in all, the data for Season One are somewhat lower than other first-year series we have written about in this space. 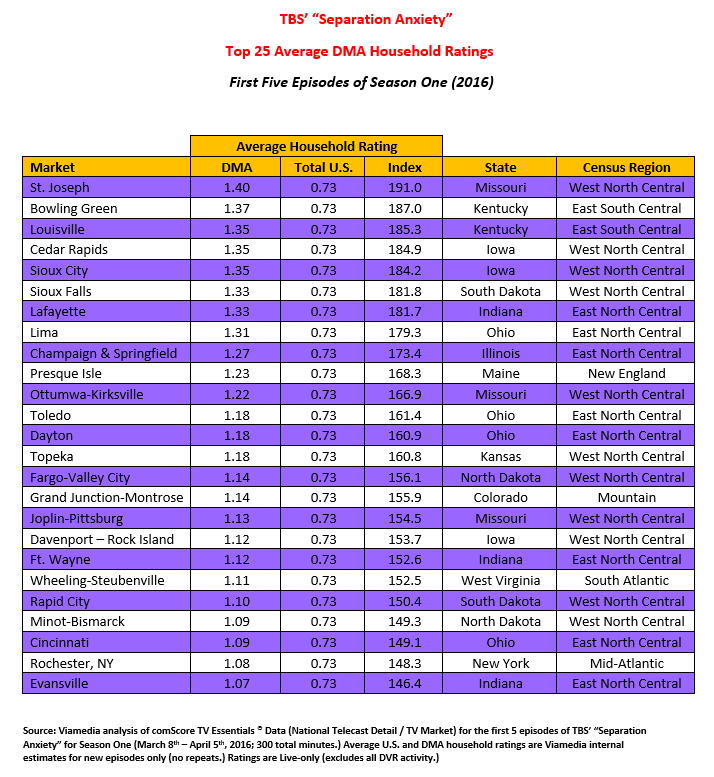 In all, the show attracted over 20 inaugural local advertisers who ordered 230 spots across 21 Viamedia markets (over one-quarter of Viamedia’s national footprint.) That comes to an average of over 9 spots per client. Since the advent of television, hundreds of game shows have preceded “Separation Anxiety”-- something like 650+ and counting (according to Wikipedia). 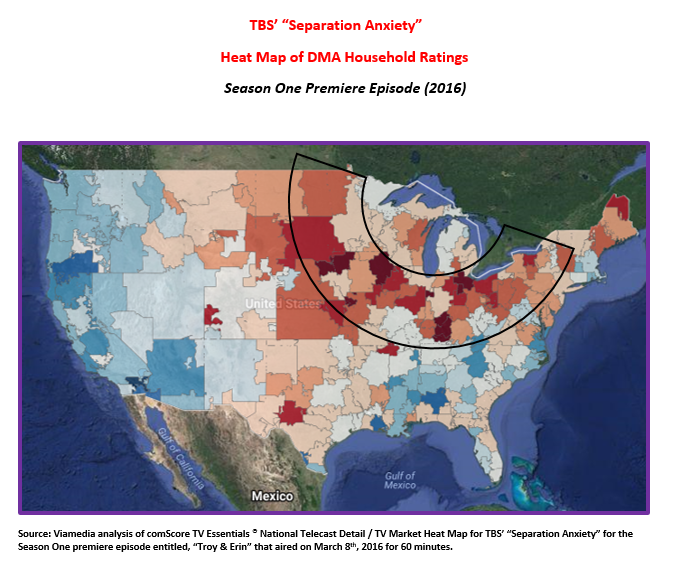 But TBS’ entry in the genre comes with a major twist: a game show within a game show in which one partner is unaware of the stakes that he or she is actually playing for, while the other partner looks on in anguish… but not too much anguish. And that’s because “Separation Anxiety” is almost like a sit-com as one comedian (Iliza Shlesinger) gives on-air cues to another comedian (via a one-way communication earpiece device) who serves as the faux, low-budget game show host. If Season Two is anything like Season One, then the show will deliver a fair amount of tension leavened with a good deal of good-natured fun and laughter.